Prior experience or familiarity with the grant writing process is recommended. 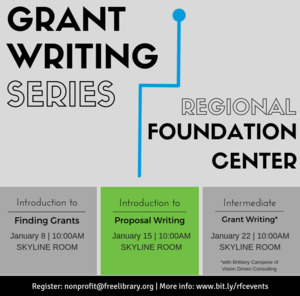 If you are new to grant writing then we encourage you to take Introduction to Finding Grants (1/8/2019) and Introduction to Proposal Writing (1/15/2019) being offered by the Regional Foundation Center. If you cannot attend our in-person programs please watch the webinar versions available on Grantspace. Advance registration is required as space is limited; please email the Regional Foundation Center at nonprofit@freelibrary.org. Tuesday, January 22 | 10:00 a.m. - 12:00 p.m.